Stripes and polka-dots are two of my favorite things. 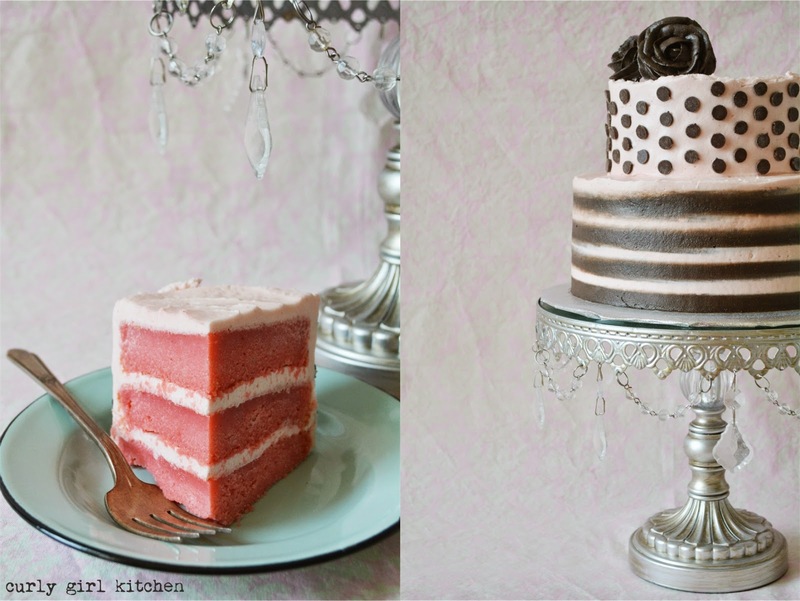 I wear them, I decorate my house with them, and now I'm loving dressing up cakes with them, too. With its striped skirt, polka-dot top and flowers, this cake is like a pretty little dress, don't you think? In the spring, when the first blushing stalks of rhubarb can be found, tucked behind the kale and purple cabbage on the grocery store shelves, I bring home as much as I can. Rhubarb has such a short season in Colorado, never to be found again later in the summer, and especially not during the winter months. And I'm married to someone who absolutely loves rhubarb desserts and requests them all year 'round. So I wash it, chop it and freeze it by the pound; then throughout the summer and fall, I gradually thaw out bags of the tart fruit to make rhubarb pies, or as I did last summer, strawberry rhubarb jam and rhubarb cordial for our wedding. Last spring, I made this beautiful strawberry rhubarb swirl pound cake and ice cream, one of my favorite desserts I've created, and by a happy accident, ended up with twice as much of the fruit puree as I needed. The extra puree has been tucked away in the back of our freezer, just waiting to be remembered. 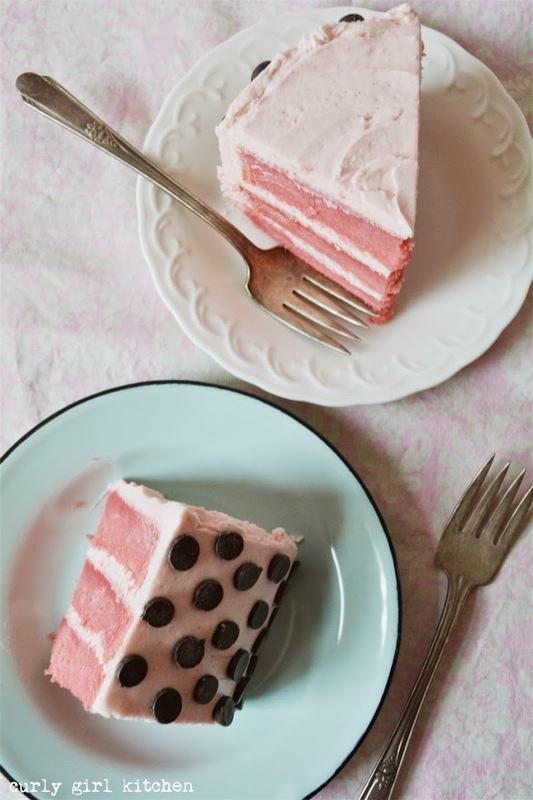 And what better time than Valentine's Day to make a pretty pink cake, flavored with one of my husband's favorite ingredients? The cake is a pound cake, very dense, moist and rich, with a tight velvety crumb. My favorite kind of cake. 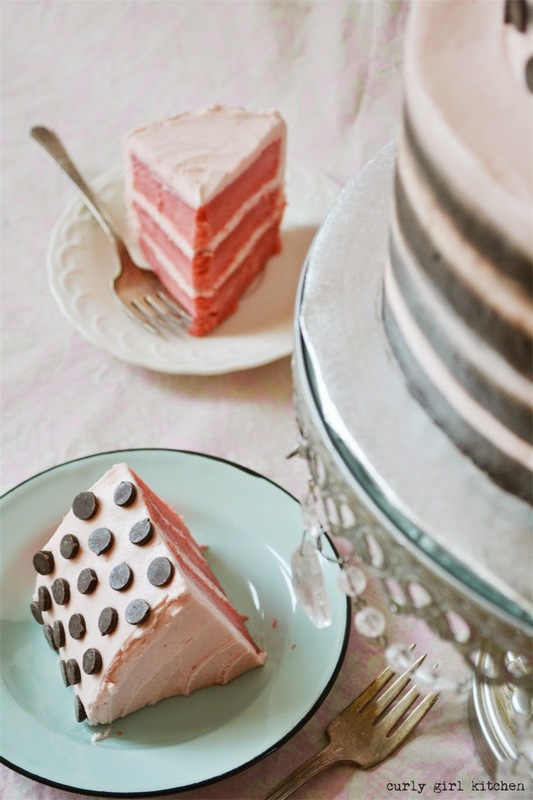 The pale pink buttercream is sweet and tart, flavored and colored naturally with more of the fruit puree, with stripes of chocolate buttercream adding a nice, rich contrast to the fruit. 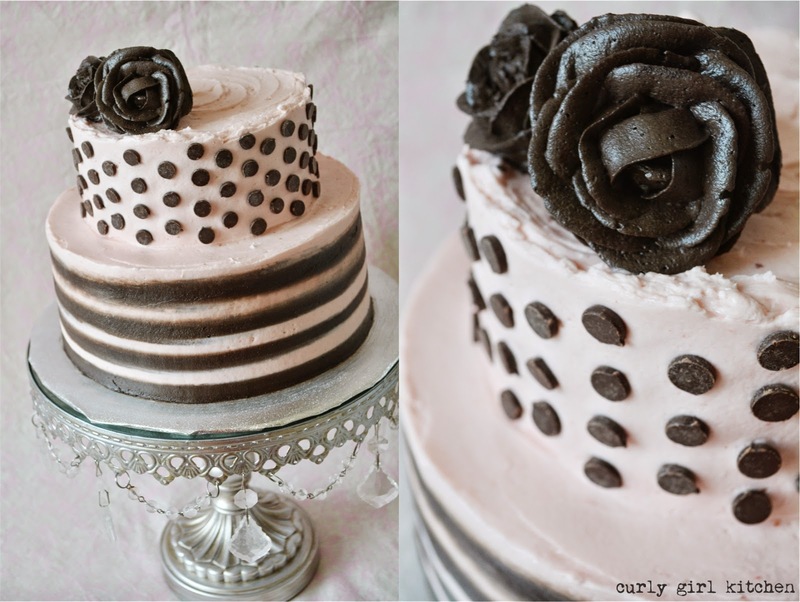 Dark chocolate chip polka-dots and chocolate buttercream roses complete the cake. I don't often pipe roses on cakes anymore, since they can tend to look slightly dated, but it was Valentine's Day, after all, and roses are to be expected. 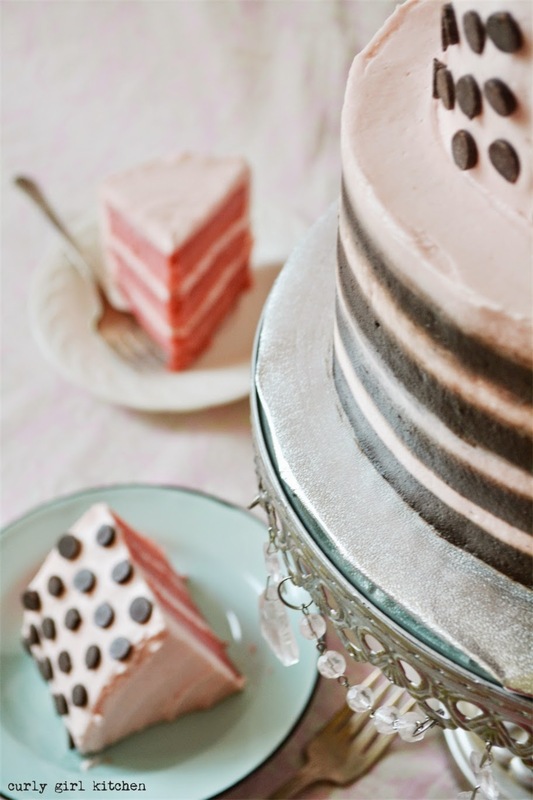 If you have a steady hand, and you pipe perfectly straight rows of alternating buttercream on the bottom tier, then your stripes will look quite impressive. I did not pipe mine perfectly, so when I blended them together with my bench scraper, some of them ran together more than I would have liked, when what I was really going for were sharp, crisp, very clean stripes, like in my Neapolitan Cake. However, I have to give myself a break, since absolute perfection is not always possible, and definitely is not in the nature of buttercream anyway. 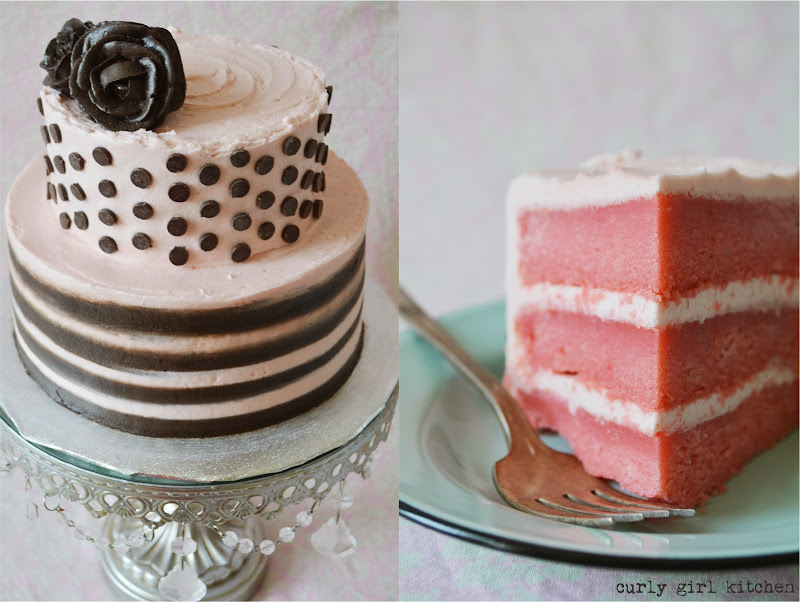 The imperfection of buttercream is what makes it so perfect, am I right? And I would rather eat an imperfectly frosted buttercream cake than a perfectly covered fondant cake any day. First, you'll need to cook and chill the strawberry rhubarb sauce; click here for recipe. This is a pound cake recipe, and the resulting cake is very dense and moist with a tight, velvety crumb texture. Right after baking, the cakes will look risen and puffed, but as they cool, the crumb tightens and the cakes settle down rather flat. This is normal for this recipe. While this is a two-tiered cake, it is still a rather petite cake due to the way the cakes tend to tighten up as they cool. Preheat the oven to 350. Spray the bottoms of three 6-inch cake pans and three 8-inch cake pans with non-stick spray and line the bottoms with parchment paper. In the bowl of your stand mixer fitted with the paddle attachment, beat the sugar, cream cheese, butter and oil on medium speed for 3-4 minutes, until light and fluffy. Beat in the eggs, one at a time, beating each for 1 minute before adding the next; beat in the vanilla bean seeds. In a separate bowl, combine the flour, salt, baking powder and baking soda. In another bowl, combine the buttermilk, fruit puree and sour cream. With the mixer on low, add the flour mixture to the mixing bowl in 3 additions, alternating with the buttermilk/sour cream, starting and ending with the flour, just until moistened. Tint with pink food coloring, if desired. Divide the batter between the pans (with about 1 1/2 cups of batter in each of the smaller pans and the rest of the batter divided between the larger pans) and bake the cakes for 20-27 minutes, until a toothpick inserted in the center comes out clean. Cool in the pans on wire racks, covered loosely with clean kitchen towels. In the bowl of your stand mixer fitted with the whisk attachment, beat the butter for several minutes until smooth. In a separate bowl, combine the powdered sugar and meringue powder. With the mixer on low, add by spoonfuls, stirring until moistened. Add the fruit puree; whip on medium high until very light and fluffy, adding a little cream if needed for consistency. In the bowl of your stand mixer fitted with the whisk attachment, beat the butter for several minutes until smooth. In a separate bowl, combine the powdered sugar, cocoa powder, salt and meringue powder. With the mixer on low, add by spoonfuls, stirring until moistened. Add the vanilla and cream; whip on medium high until very light and fluffy, adding a little more cream if needed for consistency. 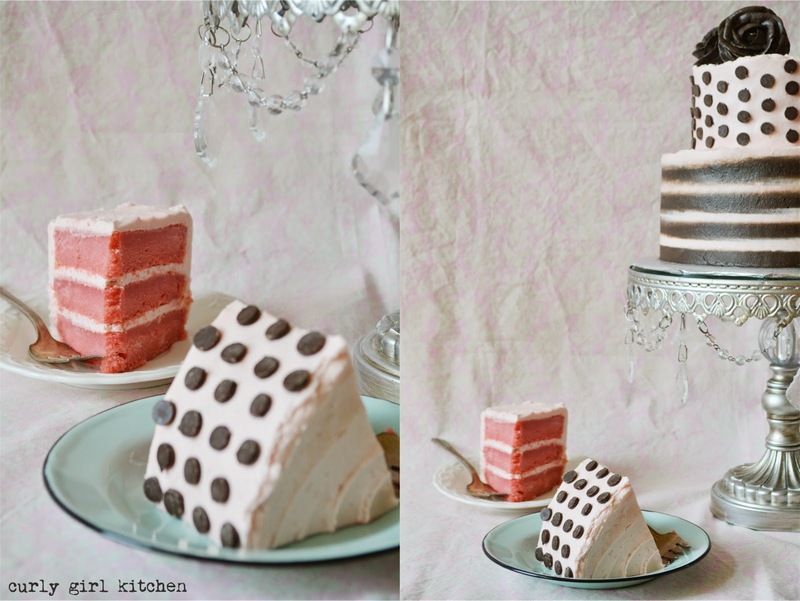 Fill and stack the cooled cakes with the strawberry rhubarb buttercream. You can stack the 6-inch tier right on top of the 8-inch tier, since the cake is very firm and can support itself without any dowels or cake boards between tiers. Frost all over with a thin crumb coat of buttercream and chill for 20 minutes. 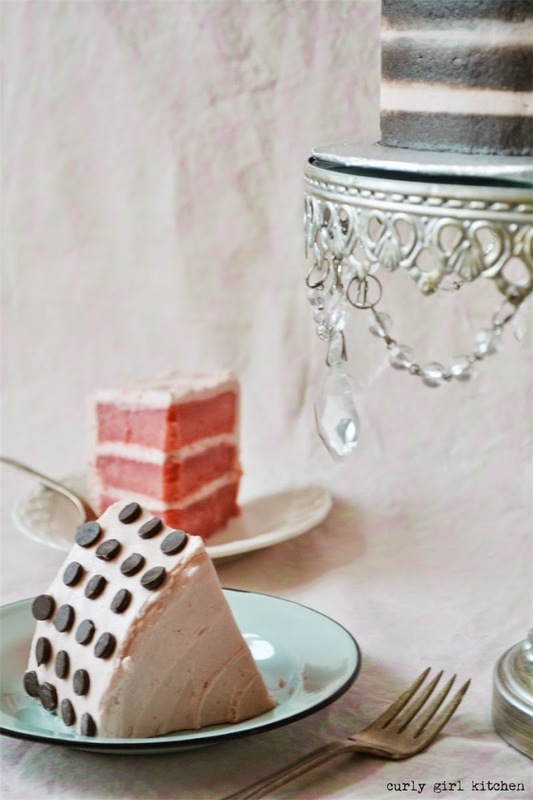 Fit two piping bags with a large round tip and fill with your two buttercreams. Starting at the bottom, pipe even rows of buttercream around the cake, alternating each row and keeping them close together. 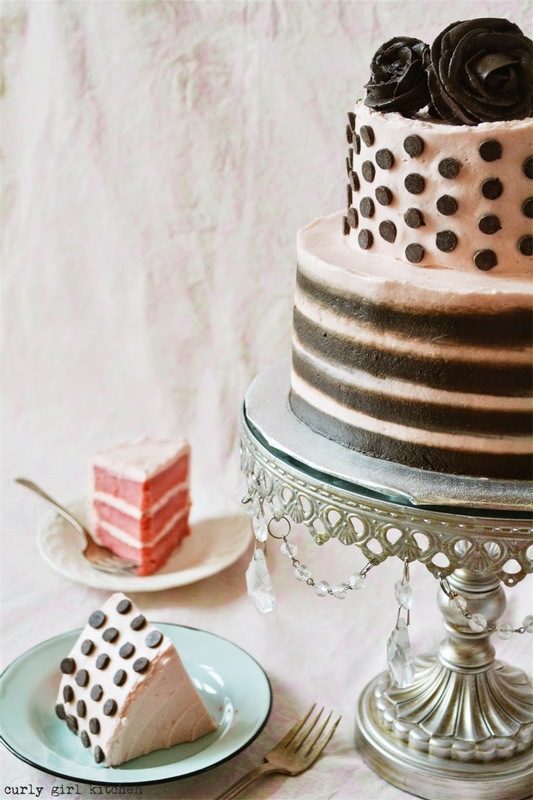 Once you've piped as many stripes as you can, take a bench scraper and run it around the the cake several times to smooth out the buttercream and blend the stripes together. 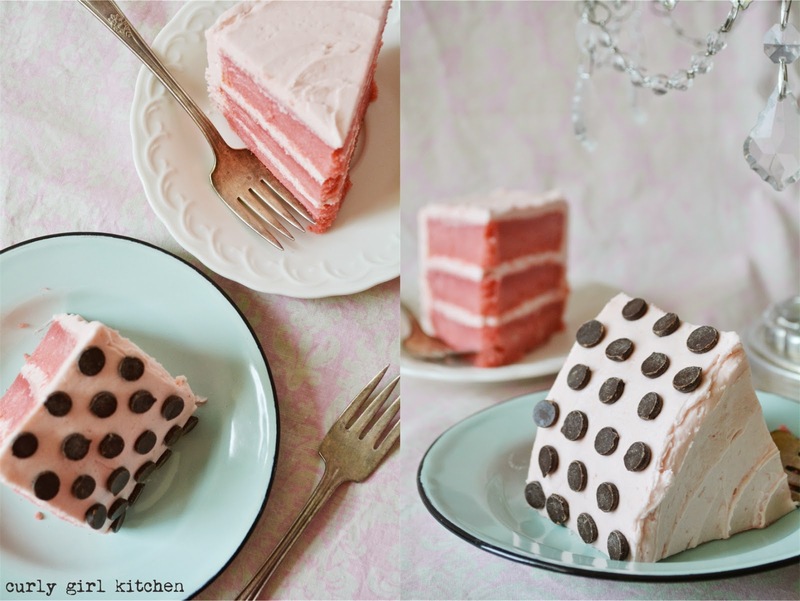 Frost the top tier with a final layer of buttercream and decorate with the chocolate chips. 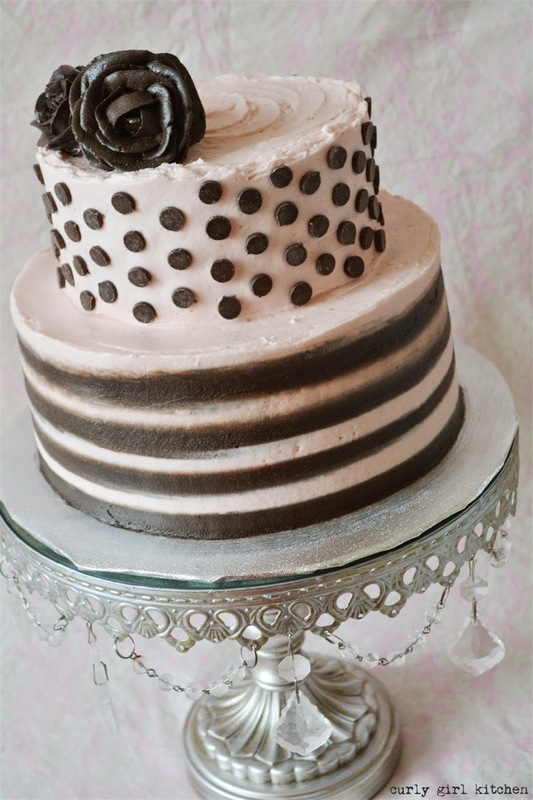 Decorate the top with chocolate buttercream roses. That cake is so so cute..